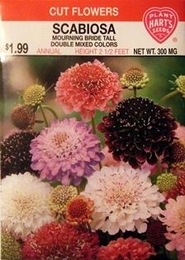 Scabiosa - Tall Double Mixed Colors, Morning Bride, Pincushion Flower. This beautiful flower is in great demand for cutting, coming in many shades of pink, red, blue, and purple. The blooms have long graceful stems and last a week in water. Scabiosa does well in most any kind of soil and will bloom profusely from mid-summer until fall. Thinning - when plants are 3-4 inches tall thin to 12 inches apart.